Paradise Greens took the opportunity to provide a new lawn for Debbie and hopes to help spread acknowledgment and support towards the military community. Switching to a synthetic lawn can help others, like Debbie, reduce the monthly water bill up to 70 percent. Paradise Greens (http://www.ParadiseGreens.com), a company who specializes in installing synthetic grass for residential and commercial applications throughout the Southwest, shows support for the community of military families and their continued service by providing an alternative to costly lawn maintenance for one of their own, Debbie Lee, founder of America’s Mighty Warriors and mother of American hero, Marc Lee. Paradise Greens stepped up to help Debbie Lee, who, like many families of deceased troops, was left to cope with the loss of a son emotionally and financially. 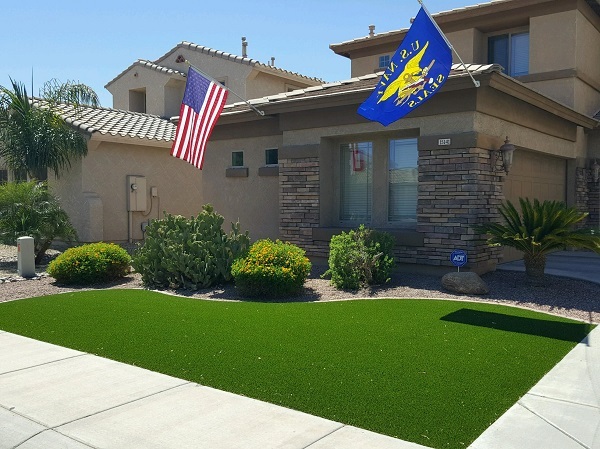 Paradise Greens hoped to provide support by replacing her front lawn and backyard with their exclusive synthetic lawn turf in an effort to help reduce home living costs. Switching to a synthetic lawn can help others, like Debbie, reduce the monthly water bill up to 70 percent. As a resident of Arizona, best known for it’s reliable sunny weather, it’s easier to comprehend the benefits of incorporating a synthetic lawn, which greatly outweighs the costs of maintaining a natural lawn. Artificial grass requires no fertilizers, herbicides, or pesticides. It’s low-maintenance, which saves time and money. In addition to this, it’s environmentally-friendly, which is especially relevant considering the demand for water is expected to exceed current supplies. “I met Debbie through some friends, and we just wanted to help Debbie and her family in any way we could, with the intended message of spreading support towards the military community. We even installed a putting green in the backyard!” said, Charlie Ferer Owner/Operator of Paradise Greens and Turf (http://www.ParadiseGreens.com). Debbie’s son, Marc Lee, was the first Navy SEAL killed in Iraq in 2006. Since then, Debbie founded the America’s Mighty Warriors (AMW) organization whose mission is to honor the sacrifices of our troops, the fallen and their families by providing programs that improve quality of life, resiliency and recovery. AMW focuses on a number of programs to help warriors and their families get access to the support they deserve such as the Gold Star Respite Program, Troop Advocacy Program, Helping Heroes Heal Program, and the Random Act of Kindness Program. Since then, she has completed a number of cross country tours, and was the First Gold Star Mom in history to visit the combat zone where her son died. Along with over 1,000 interviews, she continues advocating for awareness and support towards our troops. Paradise Greens and Turf Company, Inc.